We are in a new era of communication. The internet and social media have changed the way we connect and communicate with each other. As the body of Christ, it is important that we understand these changes, so that we can effectively serve others. Whether you are an established organisation or an individual starting your ministry, this book will help you understand these global, technology-enabled changes and how they impact churches, nonprofits and individuals in ministry. The four-part communication model and the six-step framework presented in this book will help you successfully implement a social media and digital ministry program, laying a strong foundation for the future of your ministry. In the first section, the book talks about the importance of using digital, online and social communication medium. The book explores the evolution of a new type of audience – the connected audience and helps the reader learn the biblical basis of social media marketing and its relevance to the Great Commission. In the second section, the book introduces the four-part communication model. The author lays out a broader vision of a smooth, seamless communication within the Church, as one body using social media and technology. In the third section, the book moves from visioning mode to action mode. The author presents a six-step framework as a practical means to implement the communication model in your ministry. This is a hands-on implementation section that examines management strategies, marketing strategies and operational details. In the fourth and final section, the book returns to a visioning mode as the author identifies key future trends and discusses ways in which churches, nonprofits and ministries can prepare themselves for the future. Social media keynote speaker, college educator, consultant,and best-selling author of six marketing books including Known, The Content Code, Social Media Explained and The Tao of Twitter. - Senior Pastor of AFT Church. He is one of the most prominent and respected Bible teachers in India. 5.0 out of 5 starsGreat read for Pastors, Church Administrators and professionals in 'Not for profit' organizations. PROS: This is a must read for all pastors, priests and folks who run today's churches. The book is also a great read for the people who run various not for profit organizations across the globe, even if they are not of religious nature. As a catholic, I am very concerned about the future of the Church and its sustainability. This book provides a step by step approach for the digital transformation of the church. This book clearly shows you that today's kids are tomorrow's customers/clients/audience for the church and hence Social media will have a strong impact in attracting and sustaining them in the Church. This book lays emphasis on the fact that the digital transformation of the church and leveraging the various communication channels is essential to the sustainability and future growth of the church. The author's ability to identify today's basic internet capabilities to enhance the customer experience of the church goer is wonderful. Subsections such as 'search friendly bible', 'learning from the early Church' and 'content packaging for the social media' all point to the author's command over both Social Media and the functioning and the history of the Church. It is generally tough to read through non-fiction books in a single stretch, but the flow of this particular book and the author's ability to lay out the principles in simple frameworks, lets you finish this in one go. I strongly recommend the book for anybody seeking a career in industries which are laggards in adopting social media, especially in the not for profit world. Lastly, if you don't have the time to read this book cover to cover, you should atleast read through the SPIRIT framework, its almost a social media bible to preachers of the bible. CONS: The author could have been more elaborate with the 'Future impact' chapter which is one of the most interesting chapters, but unfortunately it ends too quickly. Also, the author could have touched upon new means of revenues for the Church, leveraging Social media. Hopefully there is a 'Connected Church - Part two' soon. The Connected Church took a lot of guesswork out of growing our ministry and it de-mystified social media marketing to a great extend. 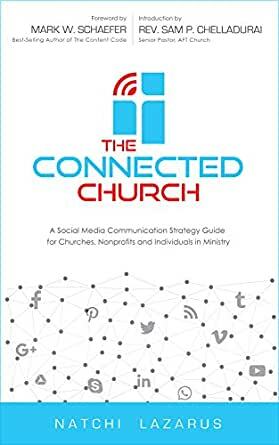 This book is a must-read for any church or ministry that wants to become more effective in communicating their message in today's noisy internet world. The author leads you step-by-step through the entire process in a practical way and using common sense language. This is not just a text book on best industry practices or the latest trends. The author gives you the WHY, WHAT and HOW while speaking from a wealth of personal experience. Indeed, we live in a new age of communication. A great speaker and a great message won't be heard anymore unless it is channeled through the right medium of communication. Just what we are looking for our church to grow in a rural environment. The ideas are easy to follow and we're hoping to grow our church fellowship by adopting some of the suggestions. This book makes you think! It provides the foundational ingredients that are necessary for developing a social media ministry. The additional tools and resources provided online, are also appreciated. Excellent observations on the evolution of human priorities and suggestions for church stratic planning. Clear and concise recommendations for success.